Thanks to a CNC solution worked out by Rexroth, ABB Turbo Systems can produce the blades for turbochargers both quickly and precisely. The story begins with Alfred Büchi, a native of Winterthur in Switzerland. He was bothered by the fact that internal combustion engines simply wasted a large amount of the fuel and was looking for a solution that would increase engine efficiency. And so, more than a century ago, he invented the turbocharger. The principle is simple. The exhaust gases created by combustion turns a turbine and it, acting through a shaft, drives a compressor. Thus more of the mix of air and fuel is pumped into the cylinder and engine performance is boosted. Today a diesel engine without a turbocharger is absolutely inconceivable – and one of the largest manufacturers is located in Switzerland: ABB Turbo Systems in Baden. This firm manufactures turbochargers for container ships, high-speed ferries and mining vehicles, themselves several stories high. They triple the power output of diesel engines, reduce their emissions, and save about ten percent in fuel. To make sure this actually happens, the turbine blades have to function perfectly – at temperatures of up to 600 degrees Celsius and turning at 14,000 revolutions per minute. Their shape and the surface quality are decisive for the turbocharger’s efficiency. That is why ABB Turbo Systems was searching for a solution that could quickly produce blades with perfect flow profiles. They hit pay dirt at Liechti Engineering AG, another Swiss company. 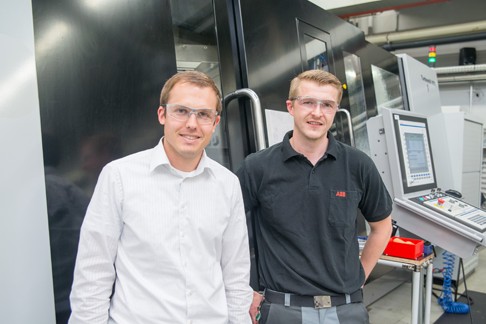 Two Turbomill 800 g machining centers offered exactly what ABB Turbocharging was looking for. And Bosch Rexroth expertise plays a decisive role in this machine. IndraMotion MTX, a CNC system, contributes greatly to the machine’s performance. 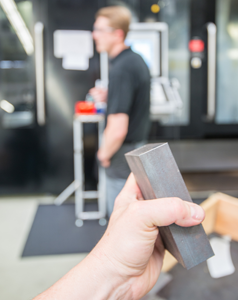 The production of the turbine blades starts with a simple block of special steel alloy. It may weigh as much as 25 kilograms. 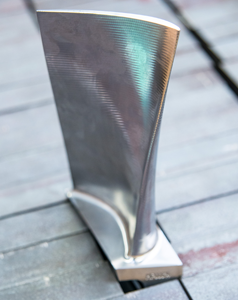 Depending on its size, it will leave the system after 33 to 52 minutes – as a finished turbine blade, ready for installation, including the engraved serial number. No touch-up work is needed. At present the machining centers produce six differing blade sizes with seven potential pitch angles. The two Turbomill 800 g units have to be extremely precise, since the blade’s flow profile is decisive for turbocharger performance. “With a manufacturing tolerance of 0.008 millimeters, we need a machine that safely controls the process and works with great repeatability,” explains Cyrill Arnet, manager for technology and investment projects at ABB Turbo Systems. This is made possible by the enormous computing power of IndraMotion MTX, augmented by decentralized control and drive intelligence. The overall solution, including the CNC control and tool drives, fine tunes the movements of the five axes in just milliseconds. One special feature in the IndraMotion MTX program is that it not only outputs the geometry but also the advancing feed for each individual NC block. In this way set-point values can be maintained exactly, ensuring optimized quality of the turbine blades. In addition, ABB Turbo Systems was able to boost the production rate by 40 percent. “For us, productivity is critical because we manufacture large quantities,” Arnet emphasizes. Fans of IndraMotion MTX: In Cyrill Arnet’s opinion, speed, precision and service life are decisive. Eduard Kuhn, on the right, is enthusiastic about the navigation through the menu. Along with speed and precision, the service life is crucial. This is because high processing velocities have a price. “When we produce more quickly, then wear inevitably rises. That is why we strive for a perfect balance between service lives and production times,” Arnet explains. Using Bosch Rexroth technology as a basis – and its associated tools for fine-tuning the drives – has made longer service lives possible. The seamless interaction of the electromechanical components, the drive regulation and Motion Control enable quick and exact machining, on the one hand. On the other hand, the precise and gentle machinery motions help the tools stay sharp for a longer period of time. This reduces tooling costs. Eduard Kuhn knows exactly how easy it is to run the Turbomill 800 g. He operates the machine and is enthusiastic about the convenient and easily understood menu prompts. "Concerning the visualization, we achieve our result with a few quick adjustments. Bosch Rexroth has constructed this very well.” This means enormous simplification in everyday work. A single production worker is sufficient to serve two systems, including the measurement technology. New staff is quickly familiarized with the system. Changing the tools can be done quickly without the operator having to click through several menu levels. Kuhn and Arnet are in full agreement that the good operability of the IndraMotion MTX was, for ABB, a pivotal point when this unit was purchased. A single machine transforms a rectangular block of steel into the turbine blade, ready for immediate installation without any reworking at all.